"Soybeans are the top agriculture export for the United States, and China is the top market for purchasing those exports," Heisdorffer said in a statement. "The math is simple. You tax soybean exports at 25-percent, and you have serious damage to U.S. farmers." The group's lobbying efforts have included a social media campaign in which "individual soybean farmers who will be directly affected by the trade conflict attached their photographs to statements appealing directly to the President and his advisors," the group said. There are 18 states that grow about 96% of the US's soybeans, according to government statistics. All but two of them, Illinois and Minnesota, went for Trump over Hillary Clinton in 2016. Trump maintains the tariffs will pressure China to address trade complaints from the US, including intellectual property theft. Retaliatory measures by China also include taxes on imports of a variety of US dairy products. It comes at a time when the US dairy industry was already bracing for new tariffs on cheese exported to Mexico. The cheese tariffs were put in place in response to an earlier tariff move by the Trump administration. Jaime Castaneda, senior vice president of the US Dairy Export Council, said the retaliatory tariffs have been a "one-two punch" that have left the industry "reeling." "You have to put all of this into context," Castaneda said in an email. "Producers have had 3 years of low prices and this fall was looking promising. We were going to get back to profitable margins for the first time in years. All that is gone now." American apple growers are also concerned about the new export tariffs. Tracy Grondine, a spokesperson for the US Apple Association, said China is a market that has "significant growth potential" for US-based apple farmers. The industry only gained access to the Chinese market — the largest consumer market in the world — about three years ago. And the nation has already become the US apple industry's sixth-largest export market, according to Grondine. "If momentum is lost it will be difficult to regain. What we will likely see happen in the short-term is apples that were destined for export markets will instead overhang the U.S. market," she said. That means US apple prices could take a serious dive, costing growers money. "This will impact growers coast to coast," Grondine said. Non-frozen orange juice will also be hit with export tariffs. A spokesperson for the Juice Products Association said they will have a "detrimental" impact on "the U.S. juice industry and hurt consumers who enjoy quality American juice products." Daimler (DDAIF), the carmaker behind Mercedes-Benz, already warned last month that its profits will fall this year. The company blamed it on the trade dispute between the US and China, saying the tariffs will result in "fewer than expected SUV sales and higher than expected costs." Daimler said those costs won't be completely passed on to customers. A spokesperson for the Alliance of Automobile Manufacturers said in an email Friday that some US carmakers may not feel a major impact right off the bat. Most companies likely have a 30-day supply of products they import from China on hand, the spokesperson said. And most US cars sold in China are made at plants located in China, so they're immune to tariffs. 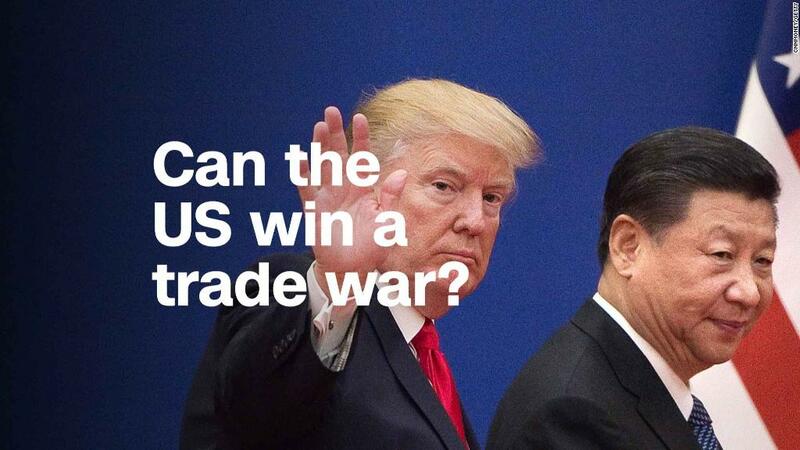 But, the longer the trade war goes on, the more severe the impact could become, the spokesperson said. Other US industries that were hit with export taxes include meats, fruit and vegetable growers, dairy farmers, tabacco, pet products, and seafood. The import tariffs will affect parts for airplanes and other vehicles that are made in China, as well as certain industrial machinery and medical devices. These tariffs and China's retaliation comes amid push back from other nations, including China and Mexico, in response to the Trump administration's import tariffs on steel and aluminum. —CNN's Jethro Mullen and Michelle Toh contributed to this report. Correction: An earlier version of this article misstated the number of top soybean producing states that voted for Hillary Clinton in the 2016 election.